Growing up in the Atlanta suburbs, Lauren Golden never imagined a future in Idaho agriculture. Her father’s backyard garden provided her first exposure to small-scale food production. “Most afternoons, my dad could be found tending to our garden – whether that was tying-up out-of-control tomato vines or harvesting cucumbers, banana peppers, and bell peppers,” Lauren explains. After earning undergraduate and master’s degrees in geography from Appalachian State University in the Blue Ridge Mountains, Lauren studied precision viticulture, the use of technology such as tiny weather motes, remote sensing, and GIS to help precisely manage where nutrients and water were needed. 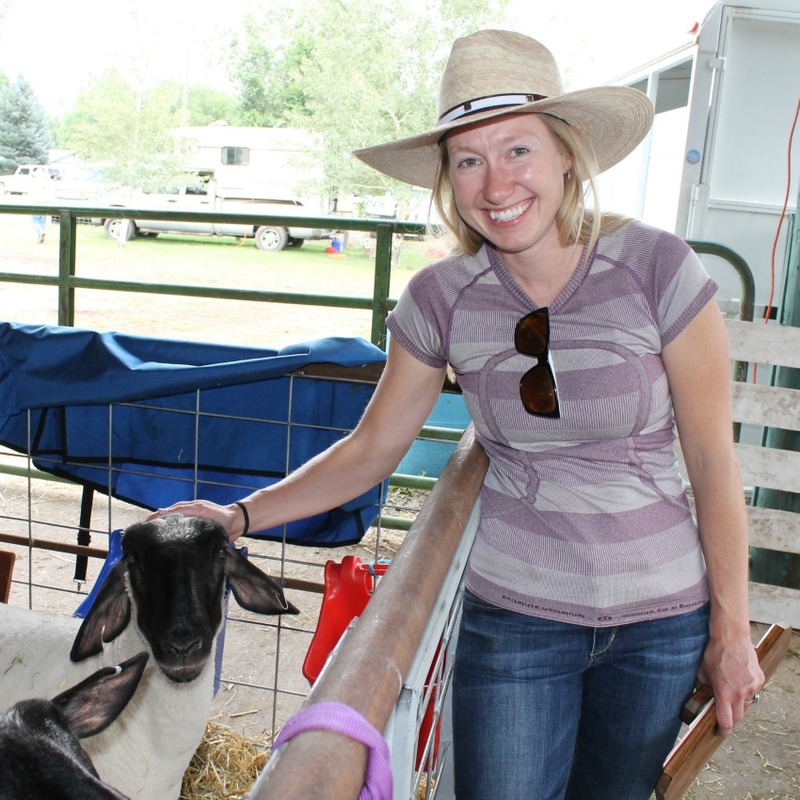 Now, as University of Idaho’s Extension Educator in Blaine County, Lauren focuses on research and outreach that targets southern Idaho’s small- and large-scale food producers. In January 2016, Lauren joined the team of the Blaine County Community Food Assessment. When she isn’t examining dairy compost as a nutrient source or other research, she is busy working on a Ph.D. in public policy and administration from Boise State University. What is your current role with respect to food in our community? Currently as the Extension Educator in Blaine County, I work one-on-one with farmers, dealing with various issues- soil health, alternative crops, marketing, etc. I host workshops on timely topics that help address producer needs; this includes bringing in outside experts to share new and valuable information. As a newly appointed role, I am very excited to help direct the Community Food Assessment Team (CFAT), focusing on improving our local food system. The CFAT is comprised of various members and organizations in the region that share the mission of working together to promote healthy food choices through education, support of local producers, and enhancing access to good food for all county residents. Luckily my husband and I cook a ton. We cook most things from scratch and enjoy plenty of time in the kitchen making and consuming good food. My main priority is sourcing local food when I can, because it is fresher, lasts longer, taste better, and is often unique in flavor, adding to our recipes. I would say my food hero is Jamie Oliver. I think most great chefs have an understanding of quality of food. Therefore, buying local is a no-brainer to them, because they can taste the difference. Like most chefs, I myself get excited about finding local markets, small butchers, and bakers to source fresh and tasty foods. I am often asked this question and my response is always that I don’t have one favorite food I like to cook because I am all about diversity. I like to try out new dishes all of the time. Recently we obtained a pasta maker, so that has been an exciting addition to our kitchen. With that, we have been making batches of ricotta and mozzarella cheese from scratch. One result was spinach, ricotta cheese raviolis. I also love trying out Asian dishes. One I frequently cook is sausage eggplant Sichuan. Asian dishes are fun because once you practice the recipe a few times, it becomes a relatively quick meal to pull together. I am not bound to buying only organic food, mostly because if I have the choice of a locally produced (non-organic product) over a large-scale, highly commercial organic product from a different state, I will choose the local product. From research, these local products often contain more nutrients and are produced on a small-integrated farm system, that does not mirror a mono-crop landscape. With my job, I work with many types of producers, large-scale conventional to small acreage organic. With that, I see the various farm practices and the respect for the land that most producers have. This instills a level of confidence when differentiating between products based on where it came from and it’s labeling. I recognize that many conventional producers have excellent farm management practices that are healthy for the land and the crop. Are you concerned about GMOs? If so, why? I see both sides of the debate for GMOs. I do question whether there are potential long-term health effects that we may be unaware of at this point in time. On the flip side, some GMO research is looking at ways to create drought tolerant crops. With the severe droughts and water-outlooks for the future, I wonder if our food system will need to look at GMO technology to resolve water-availability issues. I hope my role in agriculture helps increase the sustainability of food production. This will mostly involve, assisting the next generation of farmers to bring fresh ideas to food production as well as the widespread implementation of sustainable practices that enhance the environment. I love the idea of agricultural systems being an integral part of the local ecosystem but yet producing food, feed, and fiber for populations. This vision incorporates wildlife habitats, beneficial insects, and a systems approach that reduces the need for off-farm energy sources. I would like to see more locally produced food in all of the markets on a regular basis. I also love the idea of small farmers or businesses making value-added products available in the markets, including pesto, juice, canned goods, etc. Ideally, I would like farmers to make a sustainable living through their farm enterprise and be able to sell their products at price-points that meet the general population. What do you hope to accomplish with the Community Food Assessment? Over time, I hope the CFAT will improve all components of the local food system, including production, consumption, food waste and recovery, and food security. If this goal is achieved we can enhance the availability of locally produced foods for everyone in the community, support new businesses/farmers, and integrate new programs that make food a part of the conversation for health providers, students, and policy makers.